It's like 2001 all over again. 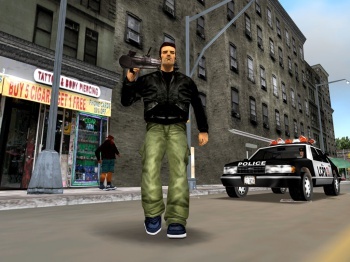 Landmark PS2 titles Grand Theft Auto III and Grand Theft Auto may be on their way to the venerable console's bigger brother, if a pair of ESRB listings are any indication. Naturally, the ESRB has slapped both titles with its "M for Mature" rating, which might only be surprising if you A.) had never heard of Grand Theft Auto before, or B.) had never paid attention to the ratings the games were given when they first came out like, a decade ago. It may be hard to imagine these days, in an era where every other game has an open-world aspect to go with its cover-based third-person shooting, but 2001's Grand Theft Auto III was a revolution. Instead of levels or worlds, it offered a gigantic city to explore as the player pleased, progressing at his or her leisure. It was utterly groundbreaking. Vice City hit a year later, updating the game with a goofy mid-80s Miami Vice aesthetic. However, both GTA 3 and Vice City were merely paving the way for 2004's Grand Theft Auto: San Andreas, which became the PS2's best-selling game of all time. Assuming these listings are true - and there's no reason to suspect otherwise - one can only hope that Rockstar and Sony have at least updated the gameplay from these classic titles that are just a wee bit clunky by modern standards. The camera control and aiming issues alone are enough to drive anybody nuts. What I'm wondering is, where is San Andreas? Having GTA 3 and Vice City but no San Andreas is like watching Iron Man and Captain America but foregoing The Avengers. You're missing the best part!